We are working with the Purdue leadership to design and guide a set of strategies to support the explosive growth of our undergraduate student body. Today one of the work teams developed success characteristic and metrics for six different strategic opportunities and they did it in 90 minutes. Strategic Doing is fast and lightweight. A welcome alternative to longer more costly approaches to strategy. Liz Nilsen and Ubaldo Cordova collaborated to create a powerful learning experience over the last week in Puerto Rico. Liz started by assembling a six-member Strategic Doing faculty team. The team included Rena Cotsones and Marco Lenis from Northern Illinois University; Janet Holsten from the University of North Carolina; Michon Hicks from the Department of Employment Services in the District of Columbia. Ed Morrison and Liz from Purdue rounded out the team. For his first steps, Ubaldo lined up the support of the Puerto Rico Science Technology and Research Trust. He also recruited about 40 professionals to take the 2 1/2 day training. From April 5-7, these professionals went through our Strategic Doing 301 training. As a concluding exercise in our training, we jointly designed a one day workshop for about 70 civic leaders from across the island. Then, a subset of our graduates served as table guides for the workshop on Monday, April 9. We designed the workshop around six strategic focus areas: economic development, community development, innovation, entrepreneurship, education and recovery. In a six-hour session that stretched from 9 AM to 3 PM, the civic leaders designed seven nine complex collaborations, each with their own Strategic Action Plan. 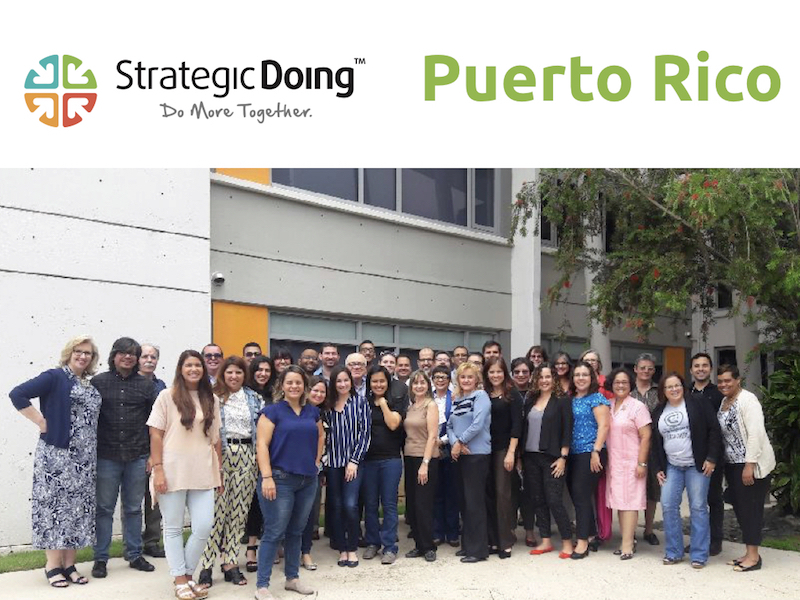 We will continue to work with our team in Puerto Rico to support their new collaborations as they spread the discipline and skills of Strategic Doing. Table Guides assess the success of their workshop on Monday, April 10. Our work in Puerto Rico demonstrates how Strategic Doing can be quickly replicated and scaled. We have confirmed that we are heading to Puerto Rico for a week, April 4-10. We are working with our colleagues with the University of Puerto Rico at Mayaguez, a land grant university. We are providing free services as a contribution to help our colleagues in their recovery. Our host is the Puerto Rico Science Technology and Research Trust. Liz Nilsen has organized six volunteer members of our SD faculty team; 2 from Purdue, 2 from Northern Illinois; 1 from UNC; 1 from Howard. We are doing a workshop from the 5th through the 7th. Right now over 40 people have signed up. April 9 we have a community meeting from 9-3:30 in which our trainees will assist. WE have over 100 people signed up. We’re finding more and more value in the concept of “strategic diversity” – that is, the way in which team members’ cognitive preferences shape their roles on the team. Learning how to optimize that diversity can take your team from average to a true “innovating network” that can solve the toughest challenges. The AEM-Cube(TM) – developed by our European colleagues at Human Insight – is an assessment of those cognitive preferences. Individuals taking the assessment will learn about how they can best contribute to a team; even better is a whole team taking the assessment and adjusting their assignments and self-management accordingly. Struggling teams will understand why they’ve gone off the rails, while already-strong teams will understand what they need to do to reach their most ambitious goals. The AEM-Cube has been a valuable tool in Europe for some time – we’re excited to be bringing it to the US for the first time.You can explore the assessment by registering here – take just the assessment, or augment your assessment report with an individualized debriefing session. Consultants will find particular value in using the assessment with their clients as part of a larger strategy development/execution engagement. “Personality profiles” aren’t enough for a group that wants to achieve transformative results – the AEM-Cube is designed for these challenging contexts. The Agile Strategy Lab can certify you to administer the assessment to your clients – join our first certification workshop April 16-17. Questions? We’d love to talk with you. 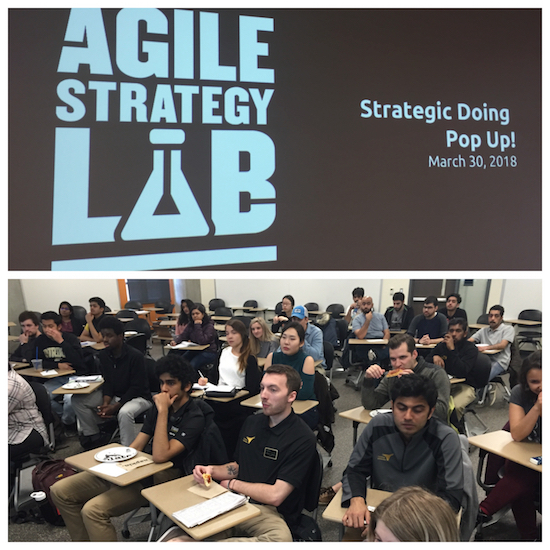 The Purdue Agile Strategy Lab is launching an experiment with “pop-up” classes in agile strategy. A pop-up is an informal class of about 90 minutes in which students engage in interactive learning experience. Working in collaboration with The International Student Peer Coaching Program within the College of Engineering, the Lab launched our first pop-up class on agile strategy Friday, March 30, from 6:00 to 7:30 PM. 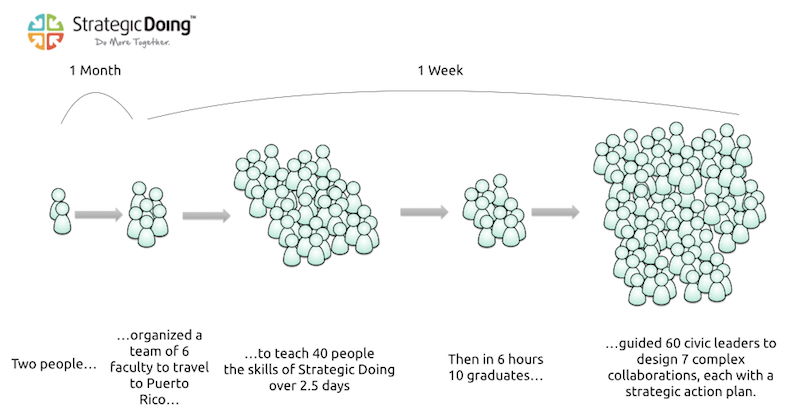 In this pilot, over forty undergraduate and graduate students participated in an overview of Strategic Doing. Using a simulation game, we introduced the process of answering 4 questions by following 10 simple rules. nIn the picture to the right, students are receiving their instructions for the simulation. Agile Strategy.— How to design and guide complex collaborations with Strategic Doing. Strategic Diversity.— How to assemble a cognitively diverse team. Here’s a good example of Strategic Doing put right to work. 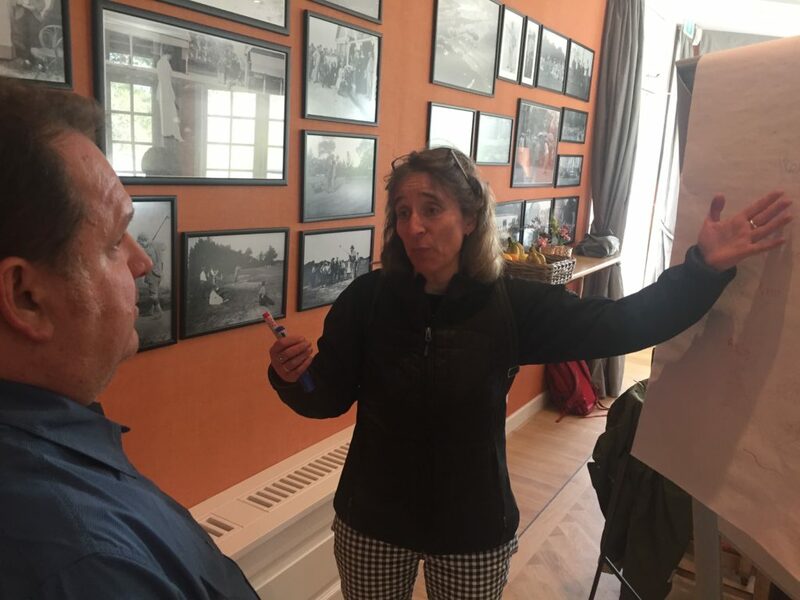 Gloria Putnam, with North Carolina Sea Grant, North Carolina State University, attended a workshop we conducted in Delaware With Sea Grant universities in the fall of 2017. 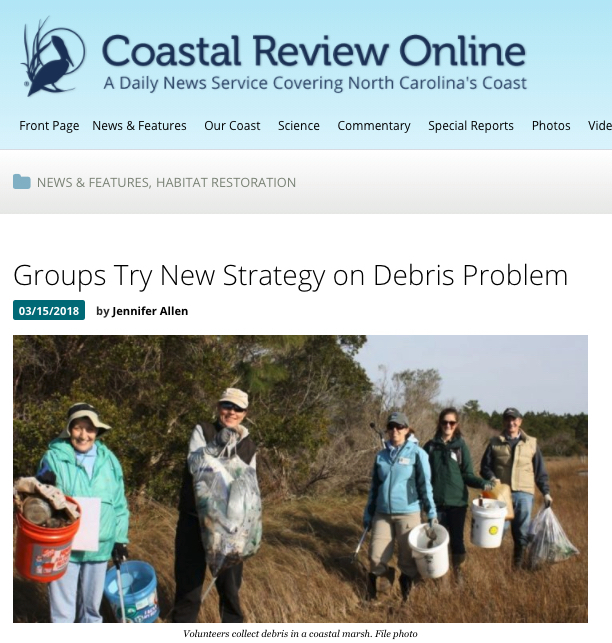 This spring, she worked with her colleagues to organize the Debris-Free NC Collaborative Workshop held in February at the NOAA Fisheries Beaufort Lab. Darrin Wasniewski made a presentation io about 100 Main Street professionals. We are building an international network of practitioners skilled in the disciplines of agile strategy and collaborative leadership. Built on the frameworks of Strategic Doing, this network is expanding into new areas such as health care, community development, and ecosystem development for innovation and entrepreneurship. One member of this international network, Darrin Wasniewski, introduced Strategic Doing to about 100 practitioners at the 2018 Main Street Now Conference. Darrin leads the Main Street program for the Wisconsin Economic Development Corporation. 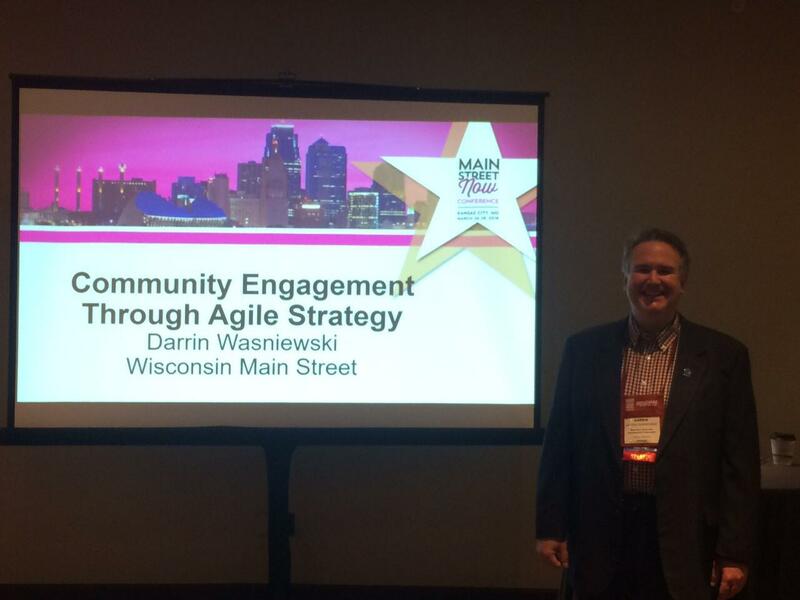 Darrin’s talk introduced his audience to “Community Engagement through Agile Strategy”. In an upcoming presentation, Kim Mitchell ind Scott Hutcheson will be introducing Strategic Doing to the American Planning Association in their annual conference in New Orleans. You can learn more about this presentation here.